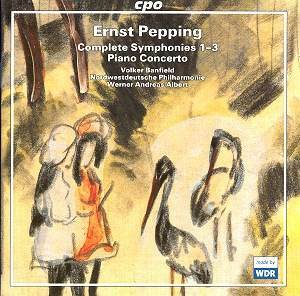 I had heretofore known Ernst Pepping by only one marvelous work, the cerebral and harmonically challenging Passionsbericht des Matth�us, a masterpiece that is woefully under-performed. When I received this set of the symphonies and piano concerto, I was expecting more of the harmonically austere, wintry aesthetic that permeates the Passion. To my surprise I heard four works of tremendous variety, intense yet controlled emotionally and utterly engaging in their sheer beauty of soundscape. The First Symphony opens with a rather rollicking almost march-like tune and is filled with interesting contrapuntal ideas. Its second movement is more harmonically rich, and rather depicts a solitary man deep in his thoughts. I was most taken with Pepping�s ample use of the winds and brass to make for unusual and ear-grabbing colors. The third movement is in a completely different mood, scampering about like a child playing in the puddles after a rainstorm. It closes with an affirming and brief movement rife with playful mixed meters. The Second Symphony is in overall tone more serious and direct. Its opening movement punctuated by dotted rhythms and an ominous descending theme in the brass. This gives way to a more airy melody in the strings and winds, but the music never becomes less than serious. The real beauty comes in the sublime slow movement. Its reflective and serene tone is spellbinding. A sprightly major key scherzo brings the mood back into the daylight, and the work ends with a majestic finale. The variety and originality of this composer�s ideas is remarkable. Written in a short six year span, the symphonies never become redundant, each work being original and fresh. The Third Symphony, with each movement depicting a time of the day, begins with an optimistic opening movement, somewhat reminiscent of Korngold�s magnificent film music. The second movement, about the midday seems the most serious, perhaps reflecting the exertion of the workday. The evening movement is glowing and restful with the final movement, Die Nacht, being more turbulent, hinting at a restless sleep full of bad dreams. The program is rounded out with the Piano Concerto of 1950. It is no less interesting than the symphonies and the added element of the soloist shows that Pepping was more than capable of virtuoso display. The solo pianist is not there, however, for the mere sake of ostentation. Of the works presented, this is the most jarringly dissonant, which is not to say that it is in any way discordant. It is purposeful and passionate, but certainly not very subtle. The solo writing is demanding and commands a solid technique. The part rather demands the listener�s attention. The glowing second movement is a thing of sheer beauty, even if that beauty is a bit icy. The finale is as thrilling as a good carnival ride. There is superb playing from both orchestra and soloist throughout this entire program. Particular mention should go to the wind and brass sections of the Northwest German Philharmonic. This music calls on them heavily for both color and melodic interest. Werner Andreas Albert has made quite a few fine recordings for CPO and this is no exception. Once again, this company has given us a couple of hours of splendid listening that we are not likely to get anywhere else.� Here�s a challenge to some adventuresome orchestra: program one of these pieces! If there is one criticism that I frequently have of CPO it is their tendency toward wordy, rambling Dickensian translations of overly esoteric program notes. Even with two music degrees and then some under my belt, I quickly lose interest in the overtly academic tone of notes from this company�s releases. I think it comes from the complexity of the German language, and the notes seem to me to be a direct translation. They never capture the spirit of English very well and leave me cold. Having said that, no one should shy away from grabbing this fine release. Gorgeous music beautifully played in first rate sound. Highly recommended.